Why use TruRT to automate Regression Testing? Why use TruRT for Regression Testing? You can easily build and automate regression testing even for the most complex web applications. Its value-loaded features makes testing more productive than conventional testing tools. A person with only a business knowledge of the web application can start using TruRT. It requires no programming and is intuitive to use. A tester with good skills can save time on test management and reporting. If required, a skilled tester can also code scripts in the test case. 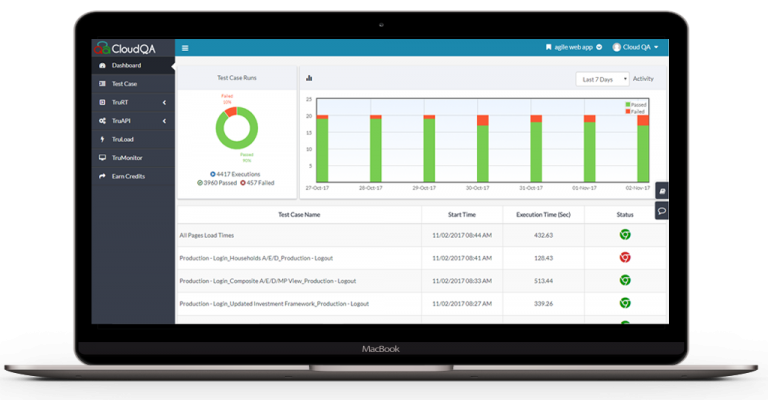 Unlike conventional regression testing tools which require expensive infrastructure, TruRT’s cloud testing platform executes the test cases in only a fraction of the cost. Widen the participation of developers, domain experts, and business analysts. Take regression testing in agile to the next level! Integrate with third party tools for CI/CD, alerting, bug tracking and team communication. Take help for testing your web app or resolve your issues with our experienced test engineers. Receive a solution within one working day. Get more focused on regression testing and relieve from the pains of costs, complexity and inefficiency in your QA.